Here is some good advice (and a book recommendation) for PhD students and advisors of PhD students by Sundar Christopher. 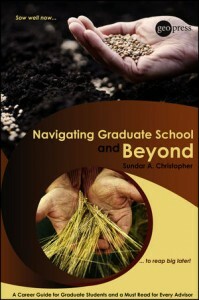 The book targets the graduate student experience in the US, where students often enter PhD programs right after College. Several European institutions have developed attractive PhD programs that combine the best features of the American system, which places a lot of emphasis on training, and the traditional European system, which places a lot of emphasis on independence. Those programs are ‘apprentice-style’: they include formalized training components, but also allow students to be contributing researchers from the very start. The entrance requirement is usually an MA, which means that students are already weaned off textbooks by the time they begin their PhD. They are ready and eager to see themselves as researchers. I myself grew up in the old-style European system, which had no formalized training for PhD students. By sheer luck, I was apprenticed by the best possible teachers you could imagine and confronted with the best research programs in formal semantics at the time. When I moved to the US, the American, ‘school-like’, system of graduate student education was new to me. To fit in, I must have overdone it at the beginning of my UMass career. One day, Barbara Partee invited me for dinner at her house together with Terry Parsons, who was visiting. I don’t remember much about that evening except for one thing that stuck in my mind. Barbara told both of us that we ‘overtaught’ our graduate students, that we ‘overprepared’ our graduate classes, and that we were too ‘controlling’ of the discourse in the class room. I took it to heart. I learned (I hope) to treat even the youngest graduate students as researchers who need guidance and help, not so much with textbook material, which they can easily absorb on their own, but with groping in the dark, seeking out their own challenges, getting used to unknown terrain, and feeling comfortable about asking probing questions. I realized that teaching PhD students ‘by the book’ (even if it’s your own) is very easy to do (no preparation required), but it is also a sure recipe for failure in the long run. Students who are taught by the book won’t be ready to do original work by the time they have to write their qualifying papers. They will remain dependent for too long. When I visited the University of Maryland during NASSLLI last year, I got to know some of the graduate students there. I saw that even first year semantics students were already working on their own original research projects. It’s not that they weren’t taking any classes. They were, but they were at the same time contributing members of research groups. This is also the way PhD students are trained in the Berlin School of Mind and Brain or at ILLC in Amsterdam. The PhD students in all three of those programs are enthusiastic and self-confident scholars who are deeply immersed in their research, mentored by specialists in their field, as well as by a Graduate Program Director. Maryland has a post-baccalaureate program providing a bridge between College and Graduate School. The Berlin and Amsterdam programs have associated MA programs that offer introductory and more specialized graduate-level classes, as well as ‘methods’ classes. In addition, there are workshops and mini-courses targeting PhD students. I think programs like these might be the future of graduate education in the Cognitive Sciences, including linguistics. The time of the ’60s-style PhD program in linguistics that was so successful in the US may be over. Training in linguistics is bound to become more like training in the sciences. Yale University has an interesting combined PhD program in Philosophy and Psychology. Since Zoltan Szabo, Jason Stanley, and Larry Horn are members of the Philosophy faculty at Yale, the program offers the intriguing possibility of PhD-level training in formal semantics and pragmatics in combination with both philosophy and psychology. Rather than acquiring breadth and well-roundedness within a Linguistics program by taking classes in, say, Phonetics or Phonology, semantics graduate students at Yale can acquire a very different kind of breadth via a formal connection with the departments of Philosophy or Psychology. Jonathan Phillips‘ profile on his website is a good example of a specialization in Formal Semantics in the context of Philosophy and Psychology. The Yale program requires students to affiliate with one ‘home department’. This is important because jobs are still mostly allotted following traditional departmental lines. PhD students also have to think about what is ahead of them. Here is a link to a very useful book about preparing students for life after the PhD: “A PhD is not enough” by Peter Feibelman. This entry was posted in Careers, Higher education, Teaching of semantics. Bookmark the permalink.